Hedge fund managers "pay less in taxes than nurses and truck drivers." 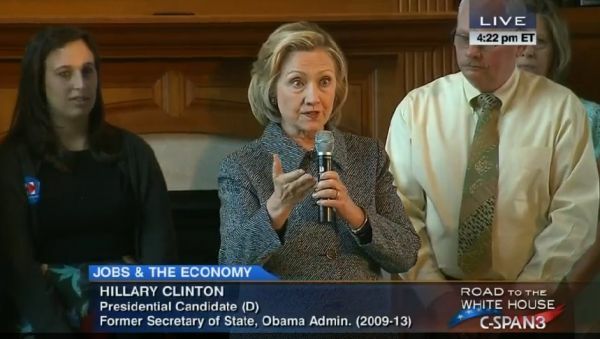 By Louis Jacobson on Wednesday, May 20th, 2015 at 11:37 a.m.
Presidential candidate Hillary Clinton spoke to supporters in Mason City, Iowa, on May 19, 2015. During a visit to Mason City, Iowa, presidential candidate Hillary Clinton resurrected an old Democratic theme -- that the rich pay less in taxes than working people do. "Hedge fund managers themselves make more and pay less in taxes than nurses and truck drivers," she said during the May 18, 2015, visit. This is a topic we’ve delved into several times previously, but the way Clinton worded this claim makes it particularly off-base. Let’s take a closer look. The available data isn’t perfect for making this sort of comparison, but we’ll use the most appropriate data we can find and note the caveats. According to the Bureau of Labor Statistics, the median 52-week earnings for industrial truck and tractor operators was $30,888 a year. For registered nurses, it was $56,680 a year, and for nurse practitioners it was $87,516 a year. Let’s take the most extreme example. Say a nurse makes $100,000, which is actually well above the median for the most well-compensated category of nurse. According to the Urban Institute-Brookings Institution Tax Policy Center, taxpayers earning between $75,000 and $100,000 pay an average tax rate of 15.7 percent, which includes not just income taxes but also payroll and other federal taxes. So that nurse earning $100,000 is going to pay, on average, $15,700 in federal taxes for the year. Nurse practitioners earning the median income level, or registered nurses, would pay less. So would truck drivers, who earn less to begin with. Now let’s look at the hedge fund manager. The IRS calculated that in 2012, the 400 highest-income households in the country averaged $336 million in income, and the cutoff to make that list of 400 was about $140 million in income. We can be pretty sure there’s overlap between the IRS list of 400 and hedge fund managers, since the most recent top 10 list of highest-earning fund managers runs from annual earnings of $425 million all the way up to $1.3 billion. These 400 households paid an average of $56 million in taxes each. In other words, these fund managers were paying multi-million-dollar tax bills to the IRS, compared to an above-average example of a nurse paying $15,700. So using taxes paid, Clinton is incorrect. What if Clinton meant tax rates? Roberton Williams of the Urban Institute-Brookings Institution Tax Policy Center told us he suspects that the point Clinton intended to make was that the primary source of income earned by hedge fund managers, known as "carried interest," is taxed as capital gains and not as earnings, and as a result, they face a rate of 20 percent plus surtaxes of 3.8 percent and 1.2 percent. In addition, there is no payroll tax payable on this income. By contrast, the income of ordinary workers is subject to both income and payroll taxes. This can narrow or erase the tax-rate gap between the two groups, at least in some cases. Is it theoretically possible that a particular nurse pays a larger share of his or her income in taxes than a particular hedge-fund manager? Yes -- each category has some variation in tax rates paid. But if you look at the typical case, Clinton’s claim paints a distorted picture of the nation’s tax structure -- and that’s if you grant that she meant to say "tax rates" rather than "taxes." Looking at income taxes alone, the average tax rate -- income taxes paid divided by adjusted gross income -- for the IRS top 400 is 16.7 percent. By comparison, the median trucker is paying approximately 6 percent of income in taxes (and there’s a decent likelihood that they are paying no income taxes at all, after consideration is made for exemptions and credits). So the median trucker is paying a much smaller percentage of income in taxes than a hedge fund manager. We should note that the definitions of income and taxes used by the Tax Policy Center and the IRS top-400 study are not exactly the same. The Tax Policy Center used a broader definition of both income and taxes than the IRS study did, which casts some doubt on the merits of comparing tax rates. When comparing total tax paid, however, the difference is so vast that methodological variations are not going to make much of a dent. Clinton campaign spokesman Josh Schwerin told PolitiFact that, as she has in other appearances, Clinton was "making the point that a nurse making $66,000 per year is in the 25 percent tax bracket while many hedge fund managers are paying less than a 24 percent rate on millions of dollars they earn." However, we'll note that a person's tax bracket refers to the rate paid on the last dollar they earn, not what they pay overall in taxes compared to their full earnings. The latter is what Clinton's phrasing suggests. Clinton said that hedge fund managers "pay less in taxes than nurses and truck drivers." She is certainly wrong for dollar amounts, which is what her statement was about. If she meant to say tax rates, that's more complicated, and the data doesn't clearly back up the point. Here, we're looking at just taxes paid, so we rate her claim False. UPDATE, May 20, 2015, 2:30 p.m.: This article has been updated to reflect a comment from Clinton's campaign staff. The rating has not been changed. Published: Wednesday, May 20th, 2015 at 11:37 a.m.